Diana Zamora Cardenas and her one-month-old daughter are featured in a missing person's flyer that's been widely circulated on the Internet. The pair disappeared from their home in Hanford on Monday. HANFORD — The Internet lit up on Tuesday night with the story of a local 16-year-old girl who disappeared with her infant daughter. Diana Laura Zamora Cardenas was last seen at home with her month-old child, Davina Alcala, on Sunday. Cardenas’ mother reported them missing later that day. Police believe Cardenas may have fled to Mexico to be with her boyfriend, Nicholas Alcala, who is wanted for murder in Fresno County. Authorities believe Alcala shot and killed 34-year-old Pedro Aispuro during a gang altercation in Huron five months ago. Alcala, a known gang member who goes by the name “Nico,” is considered armed and dangerous. Police Lt. George Hernandez said Cardenas may still be in the area, staying with friends of the suspect before traveling south. Investigators are looking for her near Avenal and Kettleman City, but have received little help from those who know the teen runaway. Foul play is not suspected in her disappearance as police believe she left home voluntarily. The National Center for Missing and Exploited Children issued a flyer about Cardenas and her daughter’s disappearance. They describe Cardenas as a Hispanic woman standing about 5 feet 1 inch tall with black hair, brown eyes and a distinct birthmark on the inside of her left arm. Anyone with information about Cardenas’ whereabouts is urged to contact the Hanford Police Department at 585-2540 or the National Center for Missing and Exploited Children at 1-800-843-5678. Police say a California teen mom is on the run with her infant daughter and a boyfriend, who is wanted for questioning in a homicide. 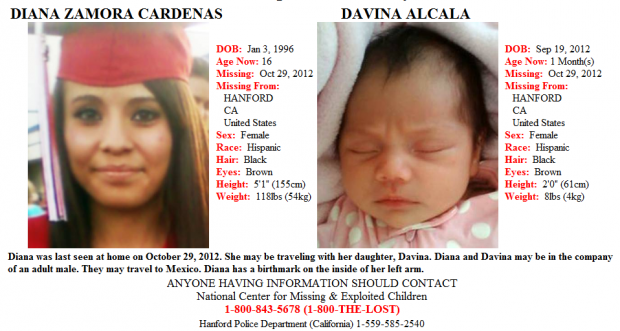 The Hanford Police Department is looking for 16-year-old Diana Zamora Cardenas and her 1-month-old daughter, Davina Alcala. According to Lt. Pat Crowe, the mother and daughter are believed to be in the company of her boyfriend, 19-year-old Nicolas "Nico" Alcala. "The baby daddy is the one we believe she left with or is going to meet up with," Crowe told The Huffington Post. "He is currently wanted for a homicide that occurred in Fresno County." Alcala allegedly shot and killed 34-year-old Pedro Aispuro on June 4 in Huron. The victim was standing outside a taco truck at the time of the shooting. "There was a large gathering on the main street of that city. There was a fight and shots were fired. As a result one person is dead having been shot numerous times," Fresno County Sheriff Margaret Mims told KFSN-TV on the day of the shooting. Family members told KFSN-TV that Aispuro had survived being shot four times during another shooting on January. Cardenas was last seen Sunday, at her Hanford home with her daughter. Investigators said Cardenas friends have been less than cooperative with the investigation. Authorities suspect Cardenas, Alcala and their child could be hiding in Avenal or Kettleman City. Investigators believe they may flee to Mexico. According to a flyer distributed by The National Center for Missing and Exploited Children, Cardenas is a Hispanic female standing about 5 feet 1 inch tall with black hair, brown eyes and a distinct birthmark on the inside of her left arm. If you see the missing trio, call the Hanford Police Department at 559-585-2540 or the National Center for Missing and Exploited Children at 1-800-843-5678. Police said Alcala is considered armed and dangerous. California authorities are looking for a teen mother and her daughter after they were last seen on October 29. The Hanford Police Department believe 16-year-old Diana Zamora Cardenas run off with her 1-month-old daughter, Davina Alcala, and the baby’s father who is wanted for homicide. Police say Cardenas was last seen on Sunday with her daughter and was not being cooperative in the homicide investigation. The father, 19-year-old Nicolas “Nico” Alcala, is wanted in connection to the Fresno County murder of Pedro Aispuro. Aispuro, 34, was shot outside a taco truck in Huron, Calif. on June 4 when a fight broke out. Aispuro was shot multiple times, and though he had survived being shot four times in January, he was unable to survive this attack. Authorities believe the teen mother and Aispuro may be heading to Mexico. Fliers with photos of Cardenas, her child, and Alcala have been distributed and Alcala is believed to be armed and dangerous. Hanford Police are asking anyone with information to call them at (559) 585-2540 or contact the National Center for Missing and Exploited Children at (800) 843-5678. Cardenas is described as a Hispanic woman, who stands at 5’1, with black hair and brown eyes. She is 16 and weighs about 118 pounds. Her daughter was born on September 19 and weighs about 8 pounds.